Alejandro grew up involved in the cattle industry in Galt, California, and has always had a desire to work with and manage livestock. “I plan on becoming a farm advisor, specializing in livestock and range management. As a farm advisor, I will be able to work with animals and apply research to innovate the management of livestock and rangelands. In the future, I also plan on owning and managing a cattle ranch”. 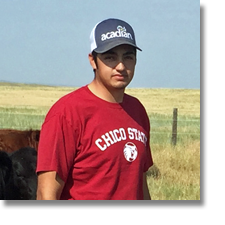 Alejandro recently returned from a summer internship in rangeland management with the Agricultural Research Service in Cheyenne, Wyoming. He is currently the president of the CSU Chico Range Managment club, and the secretary for the Student Conclave of the Society for Range Managment.